Have you heard? Majolica Majorca is hosting a BIG mascara face-off! I’ve already reviewed their Lash King in one of my previous posts. If that still didn’t do it for you, then maybe this mascara face-off will help you decide. 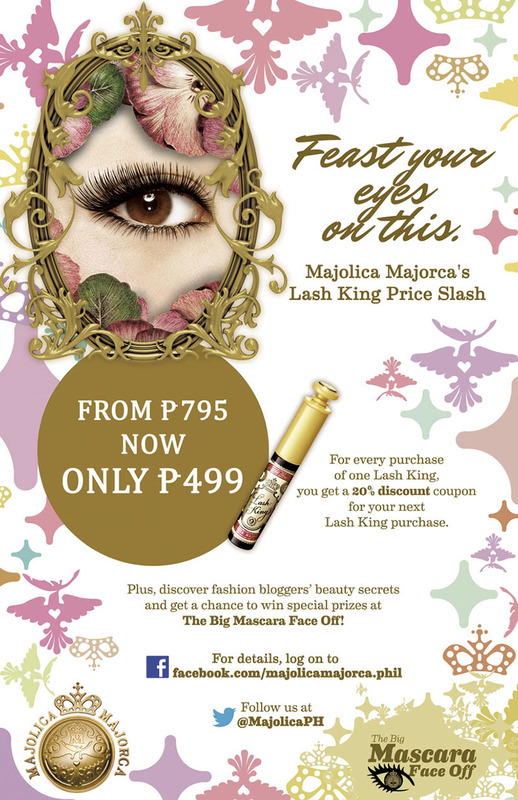 Visit Majolica Majorca in one of their branches listed on the poster below on the stated dates and get to see why the Lash king is truly the KING of all mascaras. Compare Lash King with other mascara brands on the spot and see the magic for yourself! I’M ACTUALLY PARTICIPATING IN THE BIG MASCARA FACE-OFF TOO! 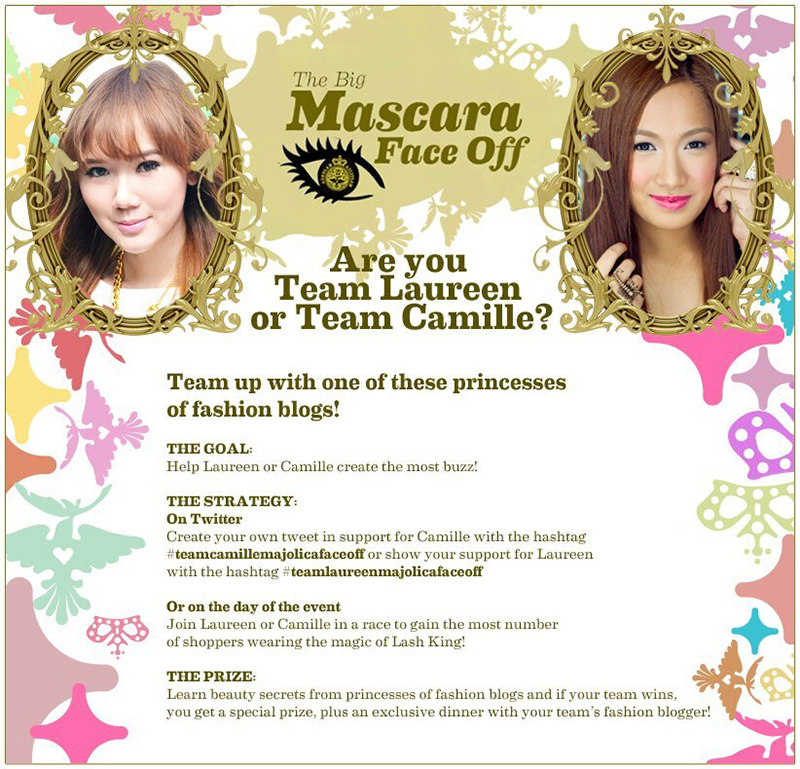 On February 9, from 4-6pm at SM Makati’s Department Store, my blogger bestie Laureen and I will be competing against each other to see who can persuade more people to to try Lash King on the spot. We’ll be asking random people who pass by to try the super quick challenge! Now, Laureen can be quite persuasive so I need all the help I can get! Will you help me out? I need to recruit 3 of my readers to become my teammates. Tweet your answer to this question: “Why do you deserve to be part of my team” Don’t forget to include #TeamCamilleMajolicaFaceoff in your tweet. From there, I’ll be choosing 3 readers who’ll be part of my team. I’ll announce who they are via Twitter on February 8. Keep sending your entries in because multiple entries are allowed. For those of you who ARE available on the 9th, drop by SM Makati and cheer me and my would-be teammates on! Help us win and participate in the challenge too! There’s a special photo wall where we can take photos together as well. It’s like a mini meet & greet! Cocktails will be served too. O diba? There’s makeup, pictures and food! We’re all set! So are you ready to help Team Camille? Let’s show them what we got! Oh, and this isn’t the only contest Majolica Majorca is throwing too by the way. Majolica Majorca and I have a little something for you to be announced on Twitter these coming days. I’m going to keep it hush hush for now but you’ll love the prize for this Twitter contest. Want a clue? It has something to do with Lash King. (Obviously!) I suggest that you go and get Lash King if you haven’t already especially now that Lash King is on promo. With every purchase of one Lash King, you get a 20% off coupon for your next Lash King purchase! The coupon is valid for use from March 1 to May 31. Not only that, from February 8-10 and February 22-24, you can get Lash King for only P499 instead of the original price of P795! Trust me, with Lash King in your kikay kit, you’re already one step ahead for this soon-to-be-announced Twitter contest! It’ll be fun! See you there! I definitely want to be part of your team! I hope my answer/tweet makes sense. Forever Team Camille! Whyyyyyyy :( Make it work! -Tim Gunn haha! My short and thin lashes will now have their justice. Hihi :) Thanks Camille! I hope to be your teammate too! Thanks Kay! :) Isn’t the promo such great news! Hey Ladies! Thanks for letting your princess be part of our Big Mascara Face Off event. We hope you will all be able to make it this weekend at SM Makati on Feb 9th from 4-6pm. Looking forward to seeing all of your beautiful faces! If you can’t make it, don’t worry. We have other SM and Watsons locations where you can purchase your Lash King at the reduced price of Php 499 too. You can start taking advantage of this discount as early as Feb 8! Don’t forget to tweet your love at #teamcamillemajolicafaceoff! There are going to be plenty of opportunities this week to win fun prizes, new collections and a chance to be on Camille’s team during the event… and of course a potential meet and greet with her after. It’s time to switch and try out Lash King! Arigatou! Pwede pong sumali kahit taga-Cebu ako? Oh Miss Camille!!! I missed you thrice :( I really need to be one of the lucky readers :) I cant wait to be with you!!! Love you!!! Aww thanks Ayah! :) See you! Hahaha :) What a nice way to describe the OA effect of Lash King. Pamaypay talaga! :) Yay!!! See you on the 9th! Yes! :) That’s the way to go! how i wish i’m in manila right now… u know when i first read about majolica here in your blog… the moment we had a vacation in manila… i purchased their mascara and eyeliner.. ms. camille do u happen to know if any online store sells majolica??? I think I would give this product a try. I usually go for maybeline and etude house mascara. great that they are on promo. You always have pretty things to share camille! You really should! Lash King is really good!